« The Complete “Metropolis” on TCM tonight! Archaeologists excavating the ancient oasis town of Tayma in northwestern Saudi Arabia have uncovered the first pharaonic inscription in the country, the cartouche of Pharaoh Ramses III, on a mountain face. “The rock was bearing an inscription of King Ramses III, one of the kings who ruled ancient Egypt from 1192 B.C.to 1160 B.C.,” said SCTA Vice President for Antiquities and Museums Ali Ibrahim Al-Ghabban at a news conference on Sunday at the Commission on National Museum. Al-Ghabban said the discovery was made in July. Since then researchers have posited that Tayma was on an important land route between the western coast of Arabia and the Nile Valley. Recent discoveries at the site prove Tayma was inhabited as far back as the Bronze Age (2,000 B.C.). The trade route has been used by caravans for centuries to carry goods such as incense, copper, gold and silver. The rockface inscription was probably a sign to travelers on the trade route helping them find their way to Tayma. The trade route crossed Egypt from the Nile Valley through the Gulf of Suez and the Sinai peninsula, then through Jordan at Aqaba and down to Tayma. 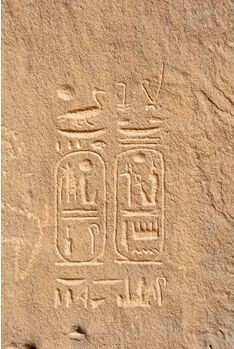 Inscriptions of Ramses III have been found at various stops on the ancient route. This is the first one found in Saudi Arabia because historically the country has been ambivalent about its pre-Islamic past. Official Saudi history begins in the seventh century A.D. with the advent of Islam, and some people think ancient artifacts are representations of just the kind of idols that the Prophet Muhammad destroyed when he conquered Mecca. Prince Al-Waleed bin Talal, however, nephew of King Abdullah and President of the Saudi Commission for Tourism and Antiquities (SCTA), has been actively working to develop Saudi Arabia’s archaeological patrimony, establishing links with overseas museums like the Louvre and allowing both local and international archaeologists to excavate Saudi’s wealth of ancient trade routes and desert cities. In 2005, he donated $23 million to the Louvre’s department of Islamic art, which then reciprocated by setting up an exhibition at the National Museum in Riyadh showcasing 150 masterpieces from the Louvre’s Islamic collection. Just this fall the Louvre in Paris put on an exhibition of 320 pre-Islamic Saudi artifacts, a full two thirds of which had never been displayed before due to the uneasy relationship between Saudi Arabia and it’s ancient past. The Louvre cleaned and restored all the pieces before returning them, so it’s been quite the productive relationship thus far. This entry was posted on Monday, November 8th, 2010 at 10:56 PM	and is filed under Ancient, Treasures. You can follow any responses to this entry through the RSS 2.0 feed. You can skip to the end and leave a response. Pinging is currently not allowed.